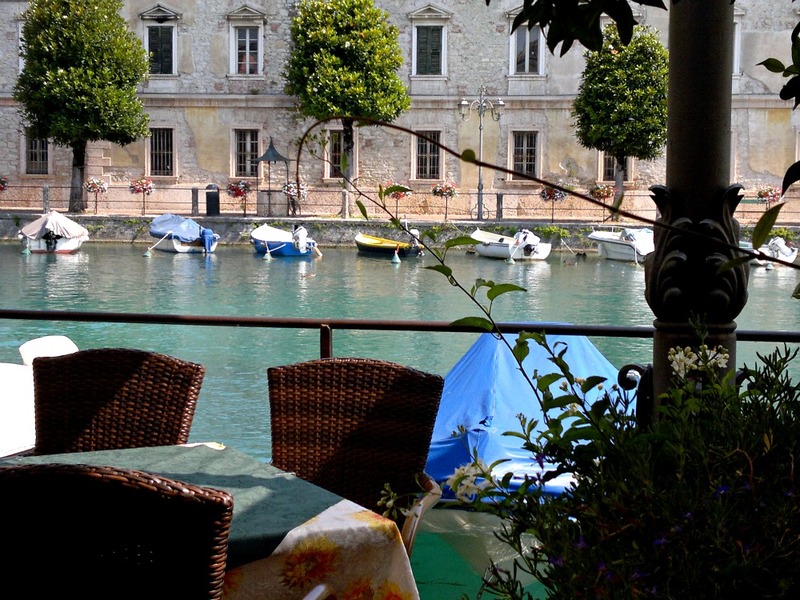 Peschiera del Garda is certainty one of the loveliest places to stay at on Lake Garda. Firstly its position makes it ideal for exploring the lake and visiting charming nearby towns like Sirmione and Lazise. It has a great cycle path that leads you inland through picturesque little towns and villages - including Borghetto sul Mincio - one of Italy's loveliest small towns. Then, little can beat long summer evenings spent in the maze of streets of the old town. 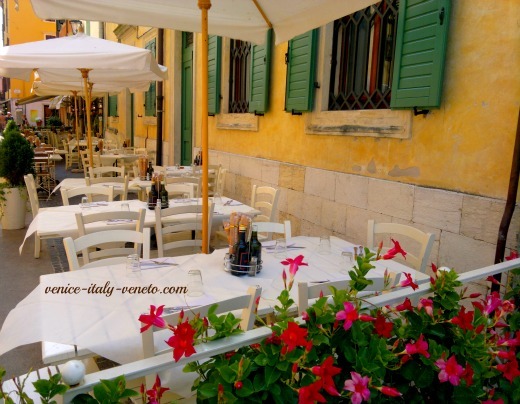 Wander the lanes or get a table at a pavement restaurant, like in the photo . Enjoy the laughter of friends and family while enjoying plate after plate of Italian food. Lastly, if you have children then Peschiera del Garda is just perfect. Right on the doorstep of Gardaland, Movieland and other theme parks. Free buses run from in front of the station to all the main parks. I tend to find three solid days of theme parks is about enough for me but my son is only just getting into it by then. Andrew and I always stay at the Hotel Puccini. It is at the end of the promenade near the beaches and a short walk to the old town. The owners of the hotel know the area inside out and will offer you tons of advice on places to visit, most of it excellent. Just don't eat at the restaurant down the road and to the left, even if the hotel recommends it - which they will - they own it! The restaurant has great views but the food is bland and uninspiring. The hotel itself is very pleasant and clean with a great swimming pool and views over the lake from most rooms. Peschiera del Garda has a long beach which, although pebbly, is a pleasant place - for the best Garda beaches click here. The old town too is interesting to wonder around and I always find a few good shops to waste my money in. For serious shopping though the Monday market is by far the best option. The main historical attraction is the medieval fortification on the edge of the old town. The canals in the town, leading onto the lake, give it a little bit of a Venice feel. There is also a lovely lakeside promenade which runs all the way from the old town to the beach. I particularly enjoy summer evenings; the family and I buy gelato (ice cream) and stroll along the promenade listening to the sounds of Italian's chattering away and the lake gently lapping at the shore while the lake turns golden... bliss! 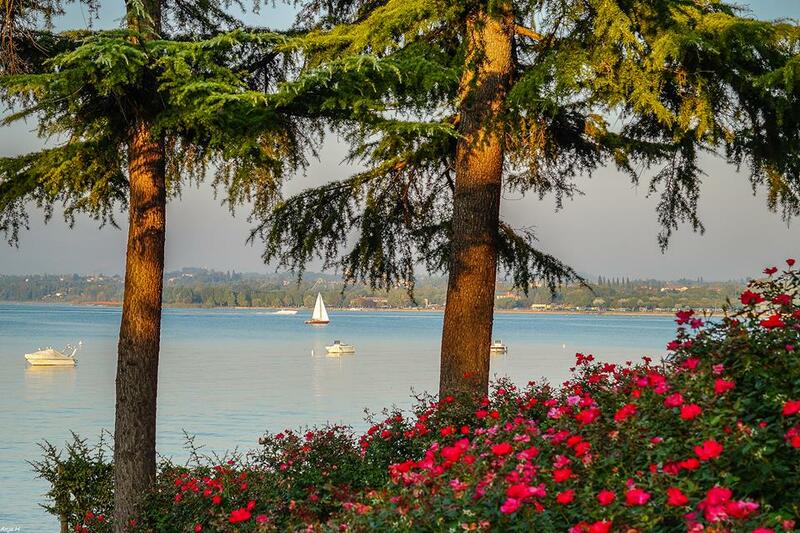 For more photos of Peschiera click here to view our gallery. Peschiera is one of the easiest places to get to on Lake Garda. The train line between Venice and Verona stops here and by car the main highway between Milan and Venice goes right past the town.